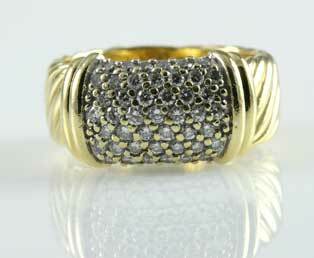 A fantastic blend of shimmering diamond pave and rich yellow gold is found in this vintage gold ring. This heavy designer cable ring brings the shine of 100 brilliant-cut diamonds. This mix of dark 18kt yellow gold and white diamonds is very eye-catching. 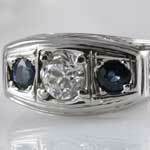 Six rows of diamonds are mounted in a this bold mounting.